In November I found a great little vintage suitcase at a local antique shop that I painted white inside and out. I was pleased with the way it turned out. 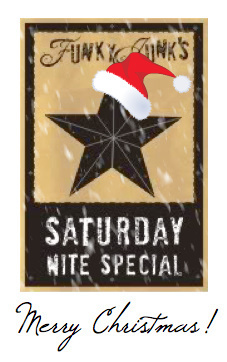 Today I changed it up from a Christmas theme to a winter scene. 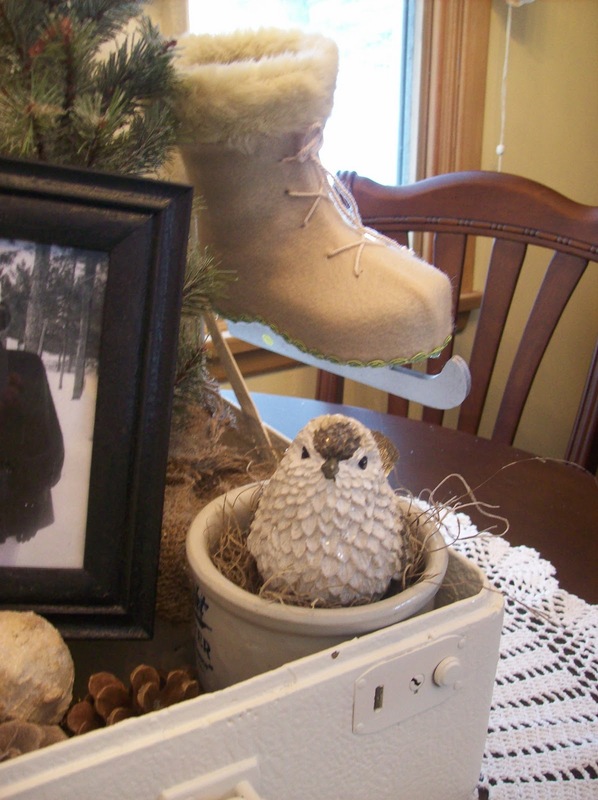 An oil lamp, lighted branches, vintage song book, pencil tree, skates, vintage fur baby booties, a vintage winter photograph, a bird in a crock and pinecones and grungy snowballs. I think this booties were mine. I moved the suitcase to my entry bench. I think I'll try it there. 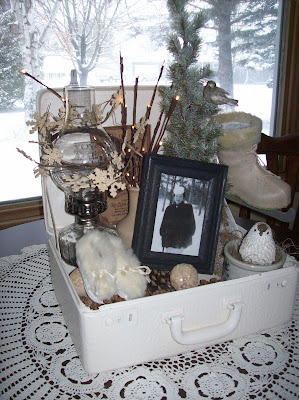 I hope you enjoyed my winter suitcase vignette! It looks great! 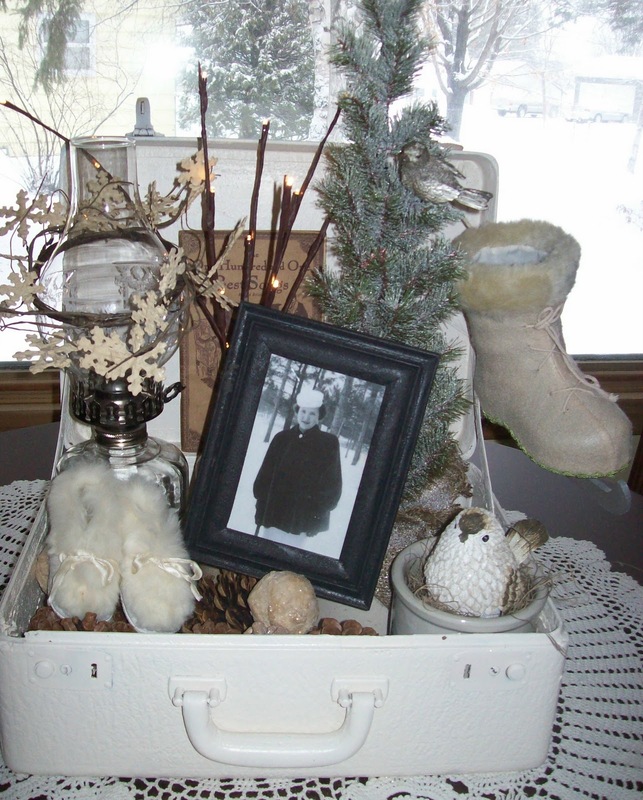 I love the idea how you painted the suitcase white inside and out. The suitcase lining was pretty soiled and an ugly color, Dana. I like it painted inside too. Love the suitcase! 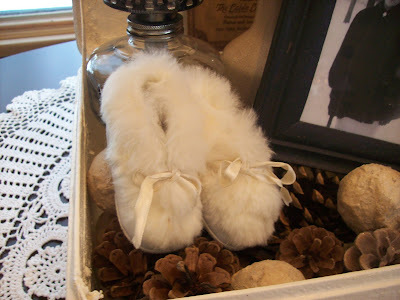 and love the winter Vignette, you are getting me thinking! I'm now a follower! 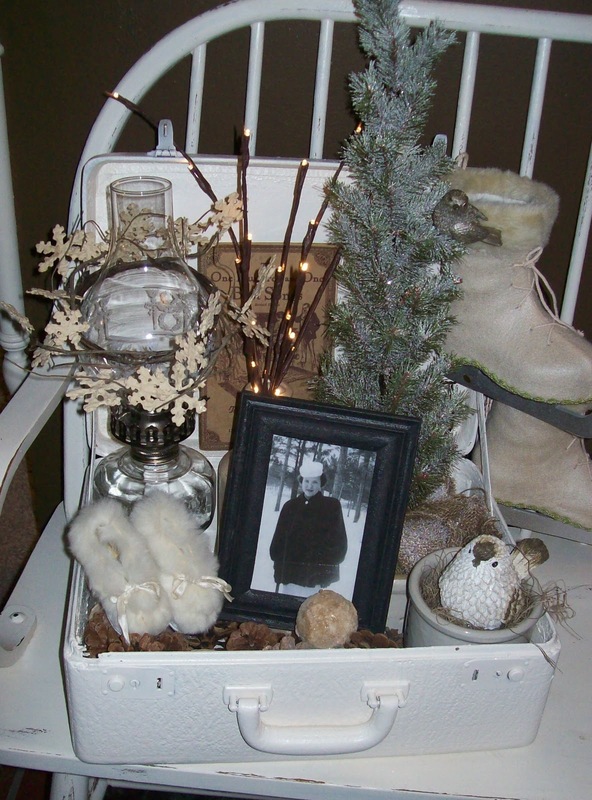 I love your winter suitcase vignette and those ice skates too. Great name for a blog ~ I should be organizing my clutter right now! I am your newest follower. I hope that you will stop by for a visit sometime. I love this vignette, and it looks great on the foyer bench! This has given me some inspiration, I have two vintage suitcases on top of our TV armoire and have been trying to decide how to do something new. Maybe I should open them up and do a vignette inside as you have. Not sure it is would show up good on top of the armoire tho! P.S. - I love the name of your blog! Thanks everyone for your nice comments. 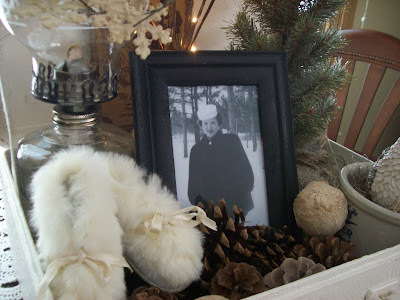 About the name of my blog...Anyone looking for clutter control or a minimalist will be disappointed, as long as it's organized, I like a little clutter. Love, love, love your suitcases and all of the little touches you added! Happy new year from your newest follower - coming over from Coastal Charm! Adore this -- especially the picture of your mom! I'd certainly enjoy looking at this all winter! Thanks Lauren I love the pic of my mom too!